TowCam image of part of the landslide scarp from which the above material was dislodged. The scarp in this image has an extensive sediment drape and has been modified by biological activity. 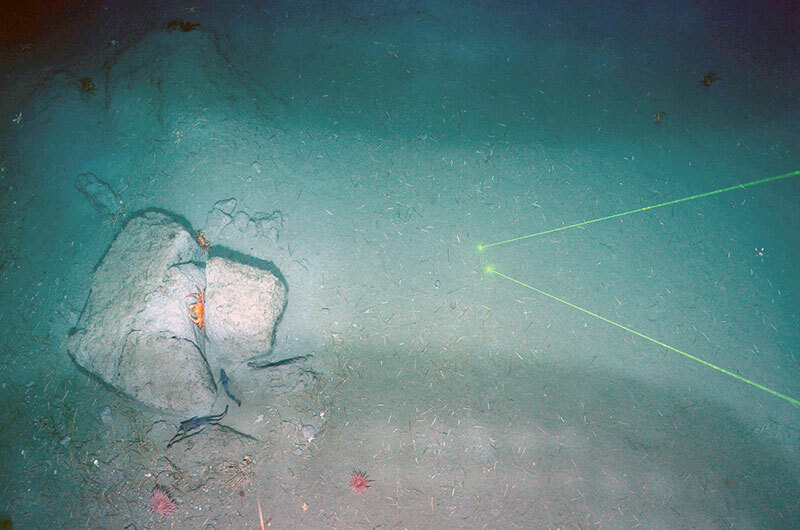 Image courtesy of the NOAA Office of Ocean Exploration and Research. Download larger version (jpg, 1.1 MB). Since 2006, the U.S. Geological Survey (USGS), with support from the U.S. Nuclear Regulatory Commission, has been working to understand the potential causes and consequences of tsunamis along the U.S. east coast and their probability of occurrence. 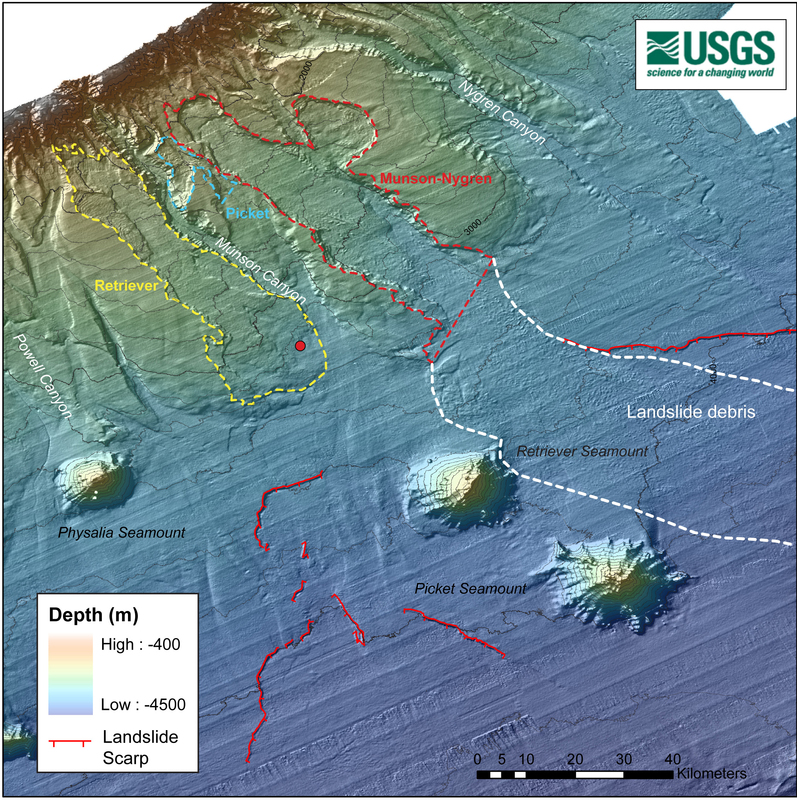 The primary focus of this work has been to identify and characterize submarine landslides present along the continental slope between Maine and Florida and subsequently evaluate the role of these submarine landslides in tsunami generation. Tsunami occurrence along the U.S. east coast is a very low-probability, but potentially high-risk, natural hazard which poses unique challenges to scientists and policymakers trying to mitigate its impacts. Seismic activity along the U.S. east coast in general is low and confirmed paleo-tsunami deposits have not yet been found, suggesting a very low rate of hazard. However, the devastating 1929 Grand Banks Tsunami and tsunamis recorded by tide stations along the U.S. east coast in April and June of this year show that these events do continue to occur. High populations, extensive industrial and port facilities, and the presence of 10 nuclear power plants along the U.S. east coast, make this region highly vulnerable to flooding by tsunamis and therefore even low-probability events need to be evaluated. The history of the continental shelf, slope, and rise offshore of the U.S. east coast reaches back to the Triassic Era (approximately 200 million years ago). Such a long period of continuous change has resulted in a complex and incomplete geologic record that must be understood, as much as is possible, to fully evaluate processes such as submarine landslides and submarine canyon formation, which have occurred in the recent past, and continue to occur today. TowCam image of debris material that has been dislodged from a submarine landslide scarp just out of the frame. The position of the debris and lack of significant draping sediment suggest that its emplacement is relatively recent. The green lasers are 20 centimeters apart. Image courtesy of the NOAA Office of Ocean Exploration and Research. Download larger version (jpg, 1.2 MB). Critical to the USGS evaluation of landslides and canyons has been the availability of high-resolution bathymetric data (the topography of the seafloor) plus multichannel seismic reflection and shallow sub-bottom profiler data (sub-seafloor profiles of the deep and shallow geological layers). These datasets, collected by NOAA (including NOAA Ship Okeanos Explorer), the USGS, the University of New Hampshire, and many other universities and government agencies, provide an unprecedented picture of the continental shelf, slope, and rise offshore of the U.S. east coast and the processes actively occurring along its length. Some of the largest landslides visible on the seafloor off the east coast cover areas of as much as 16,000 square kilometers, which is larger than the state of Connecticut. New bathymetry and sub-seafloor profiles of the shallow geological layers collected by Okeanos Explorer on the Northeast U.S. Canyons Expedition this July and August will add critical new information to the ongoing investigation of the formation and evolution of submarine landslides and canyons. Map of the Munson-Nygren-Retriever landslide complex along the lower slope off Georges Bank. Major landslide scarps and debris fields are highlighted. This is one of the landslides we are currently investigating. Image courtesy of the U.S. Geological Survey. Download larger version (jpg, 3.1 MB). One of the most important aspects of evaluating the hazard posed by submarine landslide generation of tsunamis is determining the how long ago they occurred and the possible environmental and geologic conditions which caused them. The USGS is investigating the age of landslides along the continental slope using two methods. The first method provides an absolute (radiocarbon) age and requires collecting sediment samples and extracting fossil marine organisms from them that can be dated. The second method provides a relative age by comparing geological relationships between canyons and landslide scars and debris fields visible on the seafloor. 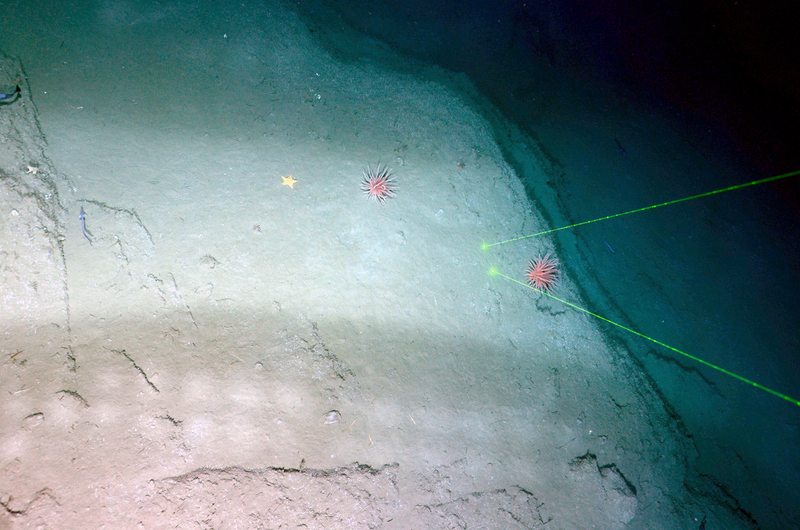 Using the Okeanos Explorer's remotely operated vehicle during the July and August expeditions will allow us to refine the relative age determination of several large landslides. The way in which submarine landslides and canyons interact, scarps resulting from landslides degrade and are recolonized by benthic organisms, and sediments are distributed across the seafloor will all provide vital clues as to the antiquity of processes capable of generating tsunamis.